Good morning! It's time once again for FingerFood's Theme Buffet! The prompt for this week was "weather". I decided to recreate another mani I did about a year ago (pic is down below). It's a beautiful day! (Unlike the weather here lately!) I started with a gradient of Zoya Blu and Wet 'n' Wild I Need a Refresh-Mint. 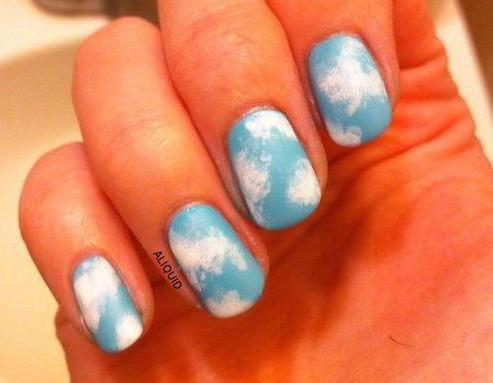 Then I made the clouds by sponging on Maybelline Porcelain Party with a little corner of a makeup sponge. The trick to doing clouds is to make sure there's not too much polish on your sponge--you want the clouds to be fuzzy and translucent. 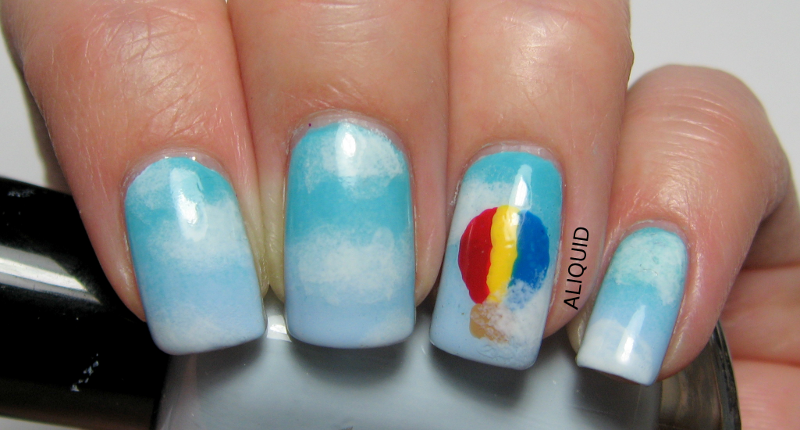 Finally, I painted the hot air balloon with Revlon Red Carpet, Sally Hansen Lightening, China Glaze Hanging in the Balance, and Julep Otte; I sponged one more cloud on over the balloon to give a little 3D effect. Don't forget to check out the rest of today's challenge manis below or by following the Pinterest board! Awww the little balloon is way too cute!! I don't think your clouds are heavy handed AT ALL. They actually came off very light and fluffy to me :) AMAZING work. Love the balloon too! Those clouds are so light and fluffy, they are perfect! Nice job!